Correspondence sent and received by the Kansas Adjutant General's Office. Thomas J. Anderson succeeded Cyrus K. Holliday as Adjutant General in April 1865. Notable correspondents include Edmund G. Ross, William McEntyre Dye, and Sidney Clarke. Several letters were also received from publisher D.R. Anthony regarding the copying and distribution of the 1864 Adjutant General's Report. Many letters acknowledge the sending and receipt of muster rolls. 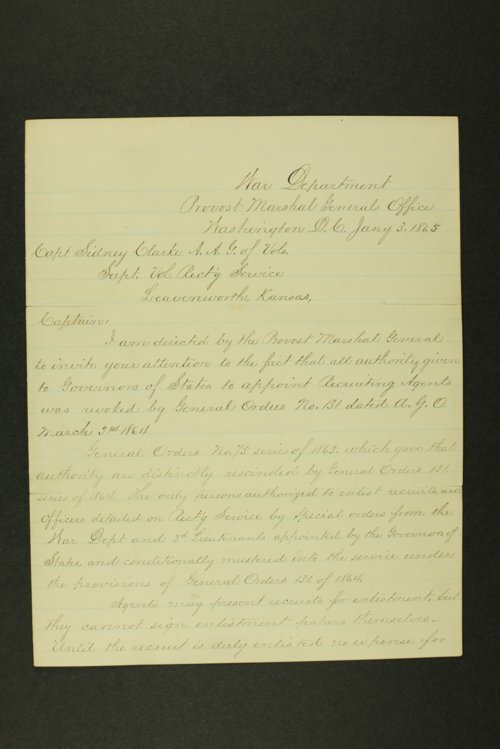 This correspondence also includes several petitions nominating a new Brigadier General, including Colonel Sandy Lowe of Douglas County replacing General William Fishbacker. A searchable, full-text version of this correspondence is available by clicking "Text Version" below.